I haven't done a post like this for quite awhile. I found that I listened and read quite a few books this month that were worth mentioning but that I did not have time or space to review so I decided bring this feature back. Death of a Prankster (A Hamish MacBeth Mystery) by M. C. Beaton - I like the Hamish MacBeth mysteries. Unlike the Agatha Raisin series by the same author which I read in order, Hamish as been hit and miss. This one was interesting. My only problem was the narrator. I didn't like his voice but the story was enjoyable. It was fun to see Hamish get the better of Blair again. Friends in High Places (A Commissario Guido Brunette Mystery #9) by Donna Leon - This is an early book in the series. I have not read or listened to the books in order but I still enjoy going back and picking up on I missed. Ghost of a Dream (Ghost Finders #3) by Simon R. Green - This is another series where I listen to book one, skipped book 2 and went on the book three. The series is fun. I like the characters. The action is sometimes a little silly but in an enjoyable way. Redemption (Soul #1) by C. J. Barry - I have really enjoyed books by C. J. Barry so I purchased Redemption as an ebook when it first came out. It has been sitting in my TBR pile every since. I enjoyed the story. It is different from other Barry books. It is a paranormal with great characters and really complex world building. I was surprised to see it is book one in a new series. 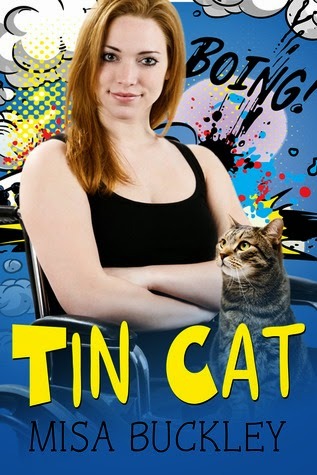 Tin Cat by Misa Buckley - Tin Cat was one of the winner in this years SFR Galaxy Awards. I read the description and immediately purchased and read. It is a cute story that has an unusual main character. She is in a wheelchair and the man in the story does not let that bother him. A nice romance with a lot of danger thrown in. 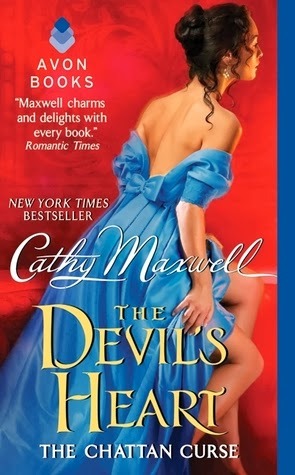 The Devil's Heart: The Chattan Curse by Cathy Maxwell - This is book three in the series. I read books one and two when they first came out but somehow never got book three. Then it came out as a 1.99 special so I picked it up. It is a great ending to the series. The two main characters are made for each other they just have to get over the last names. There is a lot of the supernatural to the story. They do get rid of the curse and have an HEA but it is a close thing. 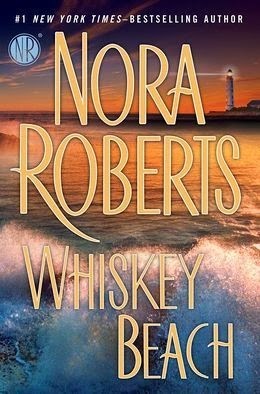 Whiskey Beach by Nora Roberts - I had not read a Nora Roberts book in several year when I came across Whiskey Beach on the new books shelf at my public library. I started the book and could not put it down. It is a great romance mixed with a very unusual mystery. I think both romance and mystery lovers will love the book. 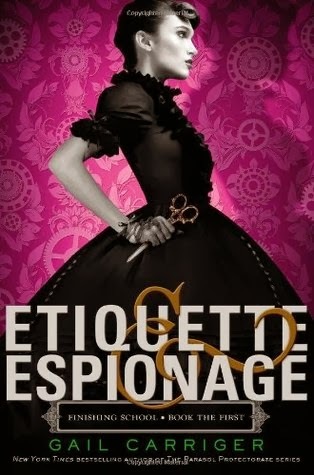 Etiquette and Espionage and Curtsies and Conspiracies by Gail Carriger - I read both book one and two is this YA series. 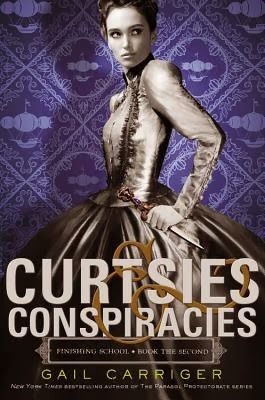 Set in the same world as The Parasol Protectorate series this is the story of Sophronia and friends at a finishing academy that is not what you would expect. You can look for a lot action and danger. While it is the same world as The Parasol Protectorate it is set before those books. Some of the characters are the same but at an earlier time. I liked the books and am looking forward to the next one in the series. I do recommend that you read them in order. There is a lot of world and character building in book one that is not repeated in book two. 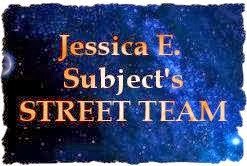 Star Pirates Justice by S. E. Gilchrist - I love Science Fiction Romance and when Star Pirate’s Justice was recommended to me I immediately picked it up. I did not realize it was book two until I started reading. While the story is full of action, adventure, and romance there is a lot of character building and back story that happened in book one. While there are hints from the previous book scattered through Star Pirate’s Justice I often found that I was lost and that affected how I reacted to the characters and the story. Carly and Volkar are both good characters but I never warmed to either. Some of the action left me the same way. I just could not see the big picture so tension in what Carly and Volkar were doing was not there for me. Since it is part of a series it also just ends with a lot left unfinished. I strongly recommend that anyone read book one before starting Star Pirate’s Justice. Having said all of that it does look like it would be a very good series if started from book one. 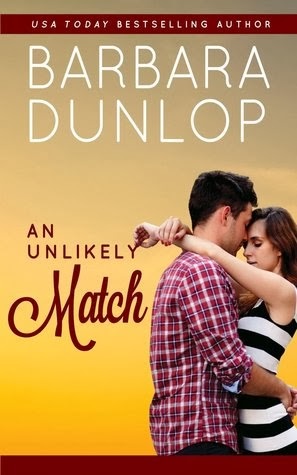 An Unlikely Match by Barbara Dunlop - This was a really fun book to read. Morgan Holbrook and Amelia Camden seem to be polar opposites but guess what. When the senior citizens in Florida put their hand to match making it turns out they are made for each other. The only problem is getting them both in the same city and close to each other. Along with being fun it was a quick easy read. The first book in the Match series after finished I wanted to find the other books. It was free on Amazon. Download if it still is. 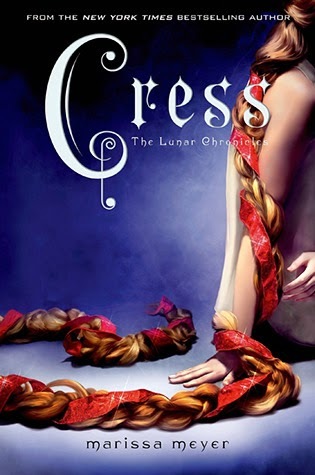 Cress (The Lunar Chronicles #3) by Marissa Meyer - I started this series with Cinder, the Scarlet and expected to finish with Cress. That was not to be. There is a fourth and I hope final book titled Winter. The story line in Cress introduces Cress and has all of the important characters headed for the same place. They do face problems and danger before they arrive. That is when the book ends so don't look for any solutions. I liked the book but did think it could have been edited down some. Since I am not a YA and am long past teenage years and teenage romances I did find some of the longing a little tedious. None of this will keep me from looking forward and reading Winter when it comes out. Molly Harper by Emelle Gamble - I received a FREE copy of Molly Harper in exchange for my honest review. In fact I received the copy around noon on a Saturday. I am recovering from knee surgery and had just over done on the knee. I needed a book that would keep my attention and keep me off of my feet for the afternoon. Molly Harper was perfect. I was drawn into the story from the first page. While the novel has romantic elements the main story is about three very different women and how their lives are connected by something 35 years in the past. I loved all three. Anne Sullivan is strong and trying to start a new life after losing her husband. Molly Harper is a movie star whose public life is unraveling and secrets from her past are changing her private life. Norma Wintz has kept a secret for 35 years and now that secret has to be told. I loved how the story progressed. As I read each woman’s story I became more and more invested in the book and my knee got a much-needed rest. I think Molly Harper is a book that most women would enjoy. One problem to watch – Molly Harper is also a popular author’s name so when you go to find the book don’t look under the title - look under the author’s name. Organized for Murder by Ritter Ames - Every cozy mystery needs at focal point. In Organized for Murder the focal is Kate McKenzie’s business – helping people organize their homes. All of the elements for a cozy mystery are here. Kate is the main character. Meg is the best friend and sidekick. Both have husbands who appear but are really just side characters. Add in a few town people and the main characters in the Nethercutt family and you have the set up for the murder and the mystery. Organized for Murder is the first book in the series so quite a few things have to be introduced. Kate’s background, the town, the characters are all woven into the story line in a way the supports the story. I found Organized for Murder to be a fun read. The plot kept my attention and kept me guessing right until the end. In addition I liked the characters, the setting (Vermont) and the writing. Pick up Organized for Murder for a fun afternoon or reading. I received a copy of Organized for Murder from the author in return for a honest review. "I should just let him die." 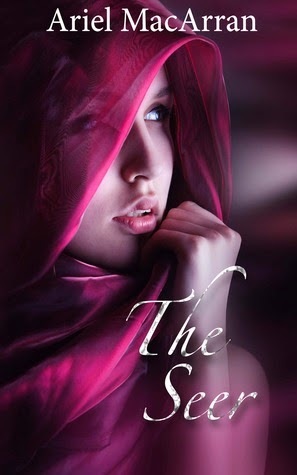 This is the beginning of The Seer a Science Fiction Romance by Ariel MacArran. Here is what Goodreads says about the book. "Discovery means death but Arissa risks everything to save Fleet officer Jolar's life. Repaying this telepath means saving her from execution and Jolar strikes a bargain that will spare her life. In return, Arissa must join him on a dangerous mission and use her telepathic abilities to help him uncover hidden forces that threaten the Tellaran Realm. Jolar will do whatever it takes to clear his life debt to Arissa. The only thing he absolutely cannot let himself do is fall in love with her." "Just how far are people willing to go to keep their secrets? Protecting the citizens of Beartooth, Montana, is never an easy job. One year later, Sheriff Dillon Lawson still feels guilty that he couldn't save his twin brother, Ethan. But the biggest test of his bravery comes when Tessa Winters arrives, claiming to be pregnant…with Ethan's baby. At first, Dillon can't decide if this beautiful woman is a con artist or a victim. If Ethan didn't die in that car crash, then where is he—and why is he hiding? Now, Dillon is prepared to do anything to uncover the truth…anything except admit his growing feelings for Tessa. But with violence threatening, Tessa and Dillon must trust in each other to save not only themselves…but also Tessa's unborn child." Atonement is another riveting story filled with danger and romance. Set in Beartooth, Montana some of the story is a carry-over from the previous books and some is new to Atonement. If you have followed the series you won’t be surprised at the level of tension B. J. Daniel infused into the story. If this is your first Beartooth, Montana story you are in for a treat. Atonement sees the end to one mystery. At the end of the last book no one knew what had happened to Pam and Frank and Nettie were left hanging. That mystery is solved in Atonement. A new mystery is introduced and a new couple work to survive and find a HEA. Dillion Lawson was a side character in previous books but takes center stage in Atonement. Now he and Tessa Winters are working to find Dillion’s twin, Ethan and remove the danger Ethan put them both in. I could not put Atonement down and read it all in one day. Now I have to wait for the next book by Daniels. Harlequin published Atonement by B. J. Daniels in 2014. Kara is a mercenary – a Diamond warrior, the best of the best, and a member of the notorious Majat Guild. When her tenure as protector to Prince Kythar comes to an end, custom dictates he accompany her back to her Guild to negotiate her continued protection. But when they arrive they discover that the Prince’s sworn enemy, the Kaddim, have already paid the Guild to engage her services – to capture and hand over Kythar, himself. A warrior brought up to respect both duty and honour, what happens when her sworn duty proves dishonorable? Blades of the Old Empire was not exactly what I expected. While Kara and Prince Kythar are major characters they are not the only ones who drive the story. It is the first book in a new series so there was a lot more that had to go into the book. World Building: This is a complex world and almost each scene has elements that add to the world. There were time when I felt lost but by the end I felt I had a pretty good handle on the world. Back Story: I have some questions about the back story. I kept feeling like I was missing something. There were times when it felt like this was book two. The characters would talk about things that had happened in the past and it sounded like I should know about those things. However when I went to check this is book one. Plot: Like the world building the plot is very complex. There are several distinct groups of people in this world. There is the past trying to come into the present. Added to that are the main characters who do not stay together. The plot unfolds as the past, the present and the characters are worked into the story. Since this is book one in the series there are also numerous hooks for future stories worked into the plot. Look for some things to be resolved but a lot left up in the air. Characters: Each of the main characters have their own story stream. The formatting does indicated when you switch from one character to another but several times I had to go back because I had not made the switch. There is some character development but this is very much an action driven story. Writing: Each scene is very well written. Action and dialog keep the story moving at a fast clip. The fight scenes were especially well written making it easy to see what was happening. Enjoyment Level: I found it difficult to get into the book at first. There was a lot I did not understand but once I got past the first few chapters I was hooked. Now I want to see what happens in the next book. Angry Robot published Blades of the Old Empire by Anna Kashina in 2014. 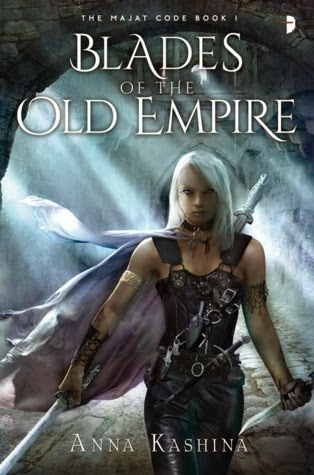 I received an ARC of Blades of the Old Empire from Netgalley. "In Isabella Bradford’s enthralling new trilogy, three noble brothers—London’s most scandalous rakes—are about to do the unthinkable: settle down. Harry Fitzroy, Earl of Hargreave, is the first to meet his match and lose his heart . . . to a lady he least expected. Harry has never met a woman like Lady Augusta. Utterly without artifice, Gus is clever and capable, and seems to care not a fig for society. After a taboo kiss awakens passion that takes them both by surprise, Harry realizes he’d almost given his heart to the wrong sister. While London tongues wag, he’ll use his most seductive powers of persuasion to convince the reluctant Gus that she belongs with him—as his equal, his love, his wife." A Wicked Pursuit uses a familiar trope, finding out that the beautiful sister is not the one you should marry. In this case the beautiful one leaves as soon as the prospective groom is injured leaving his care in the hands of her less glamorous sister. Lady Julia Barclay, Lady Augusta Barclay, and Harry Fitzroy, Earl of Hargreave are the three main characters. Lady Julia is such a shallow person I had to wonder why anyone would want to marry her. Harry Fitzroy starts out as a demanding spoiled man who I really did not like. I had to wonder why Augusta did not just boot him out of the house even though he was wounded. While I liked the way the story progressed Harry and Julia were both a turn off. I did warm up to Harry near the end and I always loved Gus. She was such a great character and so ignored by almost everyone. She deserved a HEA and I was glad to see her get one. After I got over my dislike of Julia and Harry I did enjoy A Wicked Pursuit. It does have a nice journey to a HEA for Gus and Harry. 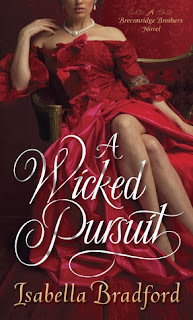 Ballantine Books published A Wicked Pursuit by Isabella Bradford in 2014. I received an ARC of A Wicked Pursuit from Netgalley. "I told you there are no secrets in Hazelton,: Meg said. frowning, "What business is it of your Vallerie?" Page 68 of Organized for Murder by Ritter Ames, the first book in the Organized Mysteries cozy mystery series . 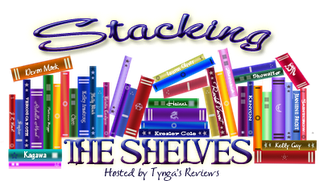 "Organization expert Kate McKenzie is on track to make her new business, STACKED IN YOUR FAVOR, a hit in small-town Vermont. But when her first client, the wealthy Amelia Nethercutt, is found dead, the job takes a decidedly sinister turn. Kate thought she and her family were making a fresh start in her husband's hometown, but she quickly learns that small towns can hold big secrets. When her first client is poisoned just after Kate leaves her mansion, she knows she's gotten off to a bad start. But things only get worse when the police find Kate's fingerprints on the murder weapon, suddenly putting her in the position of suspect number one. The stopwatch is ticking for Kate to prove she had nothing to do with the murder, and the odds are further stacked against her when items stolen from the Nethercutt mansion start showing up in the McKenzie home. Now, Kate must trust her methodical skills and expert eye to sort out who is trying to frame her and to find the real killer before she's organized right into a jail cell." 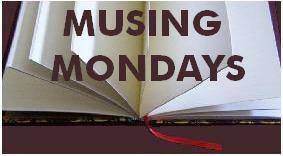 Musing Mondays asks you to muse about one of the following each week…Musing Mondays is sponsored by Should Be Reading. 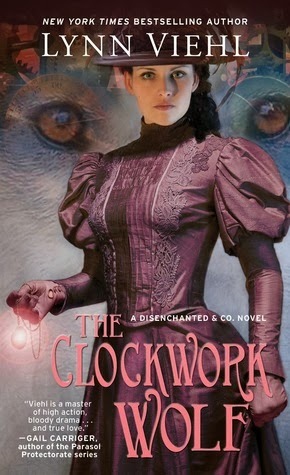 I decided to talk about The Clockwork Wolf (A Disenchanted & Co. Novel) by Lynn Viehl. I really like the series but there are reasons why I might not have. I have read other books by Viehl. She writes under several names and I first read something by her several years ago. She wrote a Science Fiction Romance series called Star Doc and I did not like it at all. In fact I read the first two books and never picked up any after that. Since SFR is one of my favorites and I did not like her books you would expect that to carry over to any other series she writes. Not so with the Disenchanted & Co. Series. I got the first book from Edelweiss and was hooked. I had to purchase books two and as soon as I got it it went to the top of my TBR pile. The Clockwork Wolf is an alternate history mixed with paranormal and steampunk. Looking that that combination you would think it would be a hard mix to pull off. One thing that makes this series so great is the main character. Kit Kittredge has her own company and makes her living solving magical crimes. She is very well developed character. Helping her (many times without her permission) are Deathmage Lucien Dredmore and Chief Inspector Tom Doyle. They are very different but fascinating characters. Then there is the world building. It is complex and very well done. The result is a interesting world that is filled with new ideas. The story in The Clockwork Wolf kept me guessing. It was full of magic and new characters that added to the world building that was done in the first book. All of this kept me reading and hoping it would not be to long before the next book is published. "The Terran Union is engaged in a vast interstellar war against the Krag Ruthless aliens intent on exterminating humankind. In 2315, the wily Max Robichaux is given command of the USS Cumberland, a destroyer with state-of-the-art capabilities but a combat record so bad, she's known as the Cumberland Gap. Capt. Robichaux's first mission: to take his warship to the Free Corridor, where the Krag have secretly been buying strategic materials, and to seize or destroy any ships carrying enemy cargo. Far from the fleet and under enforced radio silence, Max relies only on his determination and guile and the support and friendship of his chief medical officer, the brilliant Dr. Sahin. Because even as he deals with the ship's onboard problems and the stress of carrying out her risky assignment, Max and the doctor discover that the Cumberland and her misfit crew are all that stands in the way of a deadly Krag attack that threatens to end the war?and humanity once and for all. A far-future story in the tradition of ships of wood, men of iron. 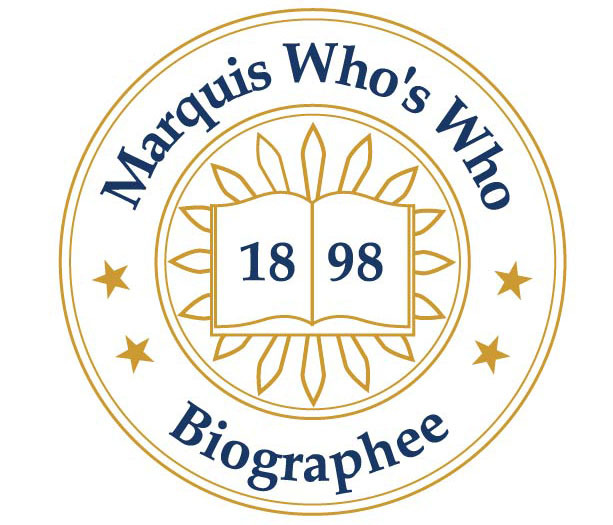 To Honor You Call Us and the Man of War series combine the adventure of exploration, the excitement of war, and the dangers of the unknown through the eyes of a ship and her crew." 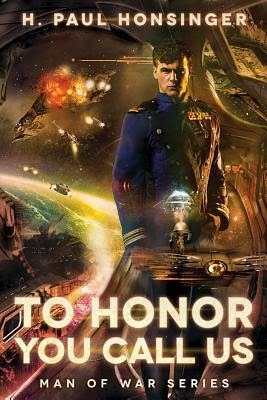 To Honor You Call Us is a must read for any Military Science Fiction fan. Honsinger takes some familiar themes and gives them a new twist. To Honor You Call Us starts with our hero, Max Robichaux, leading a successful raid against the enemy and ending up the senior officer left alive on his spaceship making him the acting Captain. Fast forward another chapter and Max is given command of the Cumberland, a problem ship that when faced with action against the enemy was noted to come, see and run. Certainly a theme that has been used before. What makes this a good read is that after that the book develops its own voice and becomes a unique story. There is great world building worked into the story and plot. Part of the world building is done with information dumps but they are kept to a paragraph or two and do not run pages and pages. I also like the explanation of why there were no women on the ships and how they felt it was a loss to the Navy that they were no long part of the space going service. The characters are interesting and very well developed. Expect the unexpected from some of the characters. The roles they play are flexible and unique adding to the depth of the story line. Then there are the aliens. Look for a big surprise about the enemy about 2/3 of the way through the book. The plot is set up for a series. Max and crew are successful at their mission but their mission is only a small part of the war. That leaves the ending up in the air with a lot of room for the action in the next book. I liked the writing. As I said there were some information dumps but not enough to interfere with the flow of the story and all had information that was needed. I found it very easy to read and keep up. The writing was very much in an active voice and kept my attention throughout the book. Pick up To Honor You Call Us for an enjoyable read. Book Two, For Honor We Stand, is already out in one addition and will be released again by 47 North on March 11, 2014. 47 North published To Honor You Call Us by H. Paul Honsinger in 2013. 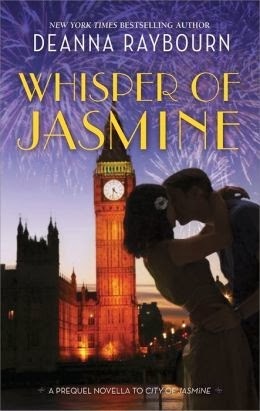 My book beginning this week is from Whisper of Jasmine by Deanna Raybourn. Delilah stared at the printed words on the sheet of paper and knew that her live had just changed forever." Whisper of Jasmine is a prequel to City of Jasmine slated for release on March 1, 2014. Share the joys, heartbreaks, challenges and triumphs of the people who inhabit the small Oregon town of Thunder Point with #1 New York Times bestselling author Robyn Carr. Eric Gentry is also new to Thunder Point. Although he's a man with a dark past, he's determined to put down roots and get to know the daughter he only recently discovered. When Laine and Eric meet, their attraction is obvious to everyone. But while the law enforcement agent and the reformed criminal want to make things work, their differences may run too deep unless they take a chance on each other and find that deep and mysterious bond that belongs to those who choose love over fear. Once again Robyn Carr takes us to Thunder Point, a small town on the Oregon coast. One of the charms of Robyn Carr’s books is her ability to create a place where we would all love to live. Thunder Point is no exception. The people are great, the scenery is wonderful and the stories touch your heart. Thunder Point has the kind of people we would all love to find where we live. 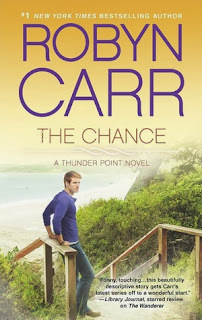 The Chance is the story of Laine Carrington, the FBI agent from The Hero and Eric Gentry, who has been a side character is several previous books. Eric did not start out as hero material. You need to read the previous books to see why. Both Laine and Eric seem to be polar opposites but they are drawn together from the first. But wait, they are not the only romance. The Chance introduces Al, who works for Eric but never stays for long. He meets Rae Ann and we have another romance that might work or might not. Then we have Justin, the angry teenager who also works for Eric. Mix it all up: add Laine’s disapproving Father and you have a great story. The Chance is book 4 in the Thunder Point series and like the Virgin River series the books come in three’s. The main characters in the first three books are relegated to side characters who do not play much of a part in book 4. For me that is one of the few things I dislike about Robyn Carr’s series. I get very invested in the characters, they are around for 3 books and then they almost disappear. However it is not enough for me to quit reading the series. 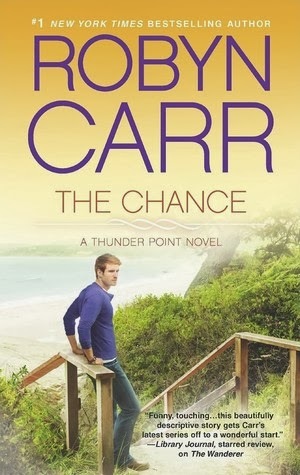 Harlequin published The Chance by Robyn Carr in 2014. "In this high-stakes thriller from New York Times bestselling author J.A. Jance, Ali Reynolds spans continents to solve a cold case murder and to figure out who wants a young juvenile offender dead. Meanwhile, in Bournemouth, Leland's hometown, Ali begins to investigate the decades-old murder of Leland's father, which Leland himself was once suspected of committing. With unsolved murders on both sides of the Atlantic, Ali, B., and Sister Anselm are united by their search for answers and the jeopardy they get into as a result. From the author praised for her "inimitable, take-no-prisoners style" (Kirkus Reviews), Moving Target sends Ali on a trans-Atlantic adventure and straight into the path of a deadly killer." I have been a fan of the Ali Reynolds books from the beginning and the series just keeps getting better. In fact I think Moving Target is the best book yet. Moving Target had two mysteries going at the same time. We get to meet Leland Brook’s family in England and watch Ali solve a cold case that involves Leland’s family. At the same time Ali and B. are planning their wedding while also helping solve a mystery involving a teen hacker that B. helped catch. I enjoyed seeing more of Leland and meeting his family. All of the action continued to flesh out his character. The action also added additional dimensions to Ali, B. and Sister Anselm’s characters. Moving Target is a character driven mystery series. Jance has continued to build the main characters while putting some new and interesting people in the mix. I see an interesting future for Lance Tucker and his family. I hope we see more of them in future books. The two mysteries are structured to allow a lot of character action while also providing a logical solution to both the mystery involving Leland and the mystery involving Lance. In addition B. provided a very elegant solution for Lance’s immediate future. You can start reading the Ali Reynolds books with Moving Target but I recommend starting at the beginning. With only 6 books in the series so far you can catch up in a hurry. Touchstone published Moving Target by Ali Reynolds in 2014. 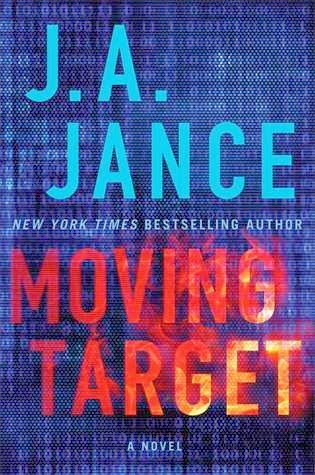 I received an ARC of Moving Target from Edelweiss.